For those of us who celebrate the holiday, Christmas is fast approaching, and with it the excitement, stress, fun, and hopefully even a bit of magic. I hear lots of people say it's all "so stressful." I can see how. Extra cooking, travel, visitors, expenses, etc... it can all add up to a challenging month. I'm trying not to feel that way during what is supposed to be the "most magical time of year." I want to enjoy it, not dread it! So let's brighten the mood, shall we? Here are five of my favorite [simple!] 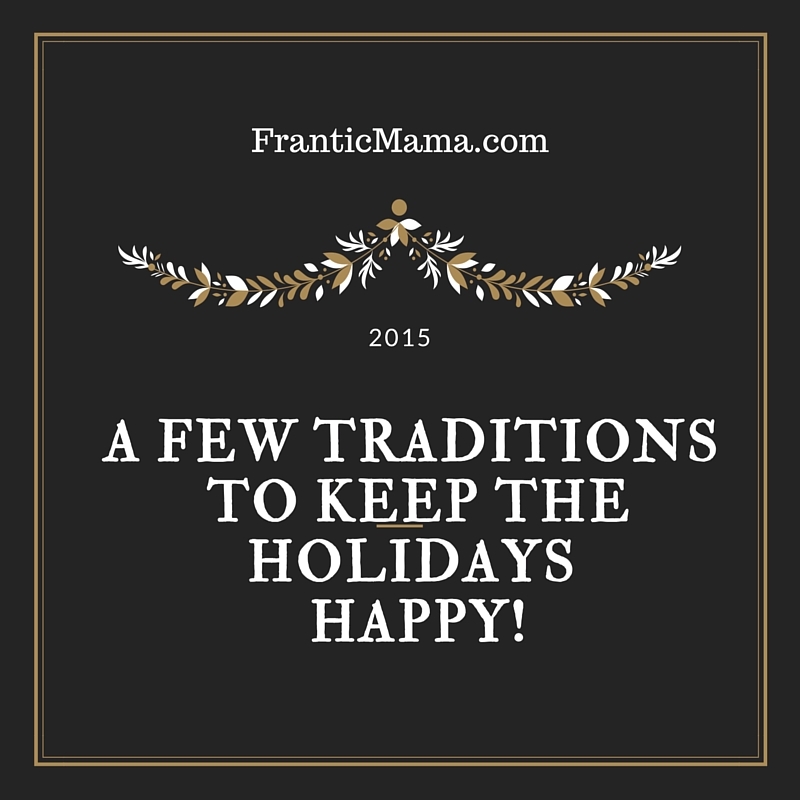 holiday traditions that help keep my family in the spirit during this time of year. 1. Decorating: Our tradition is to pick out a tree the day after Thanksgiving. There's no rush, no fuss. We we simply go to a tree lot and let the kids point to a big one and say, "that's it!" Then we let them "help" decorate it that day. It gets us all in the mood for Christmas. Check it out! My 3 y.o. took this wonderfully blurry shot of our tree this year. 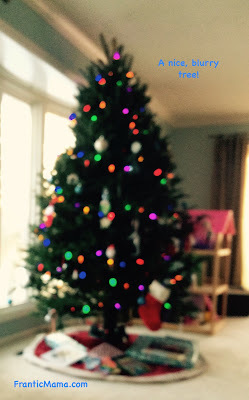 A blurry tree = the perfectly imperfect Christmases at our house. 2. Cookies: I love love love giving presents to friends, family, teachers, or really anyone. However, I don't have oodles of extra money to spend, and most adults don't "need" something I pick out for them, right? Like, how many times have you looked for a gift receipt on a random re-gift suspect from your aunt? I've jumped on the cookie bandwagon, and I enjoy making a ton of cookies (not all at once! ), letting the kids dump sprinkles on them, and putting them in cute containers. Who doesn't like an extra box of cookies this time of year? Bonus: I've spent time rather than money making something for friends, and I'm not adding clutter to their already busy homes. Voila! I'm pretty proud of how they turned out this year :). 3. Elf on the Shelf: Yes, yes, I know. People hate the elf. We like him! My husband and I have fun finding a new place in the house each night that our children will discover the next morning. 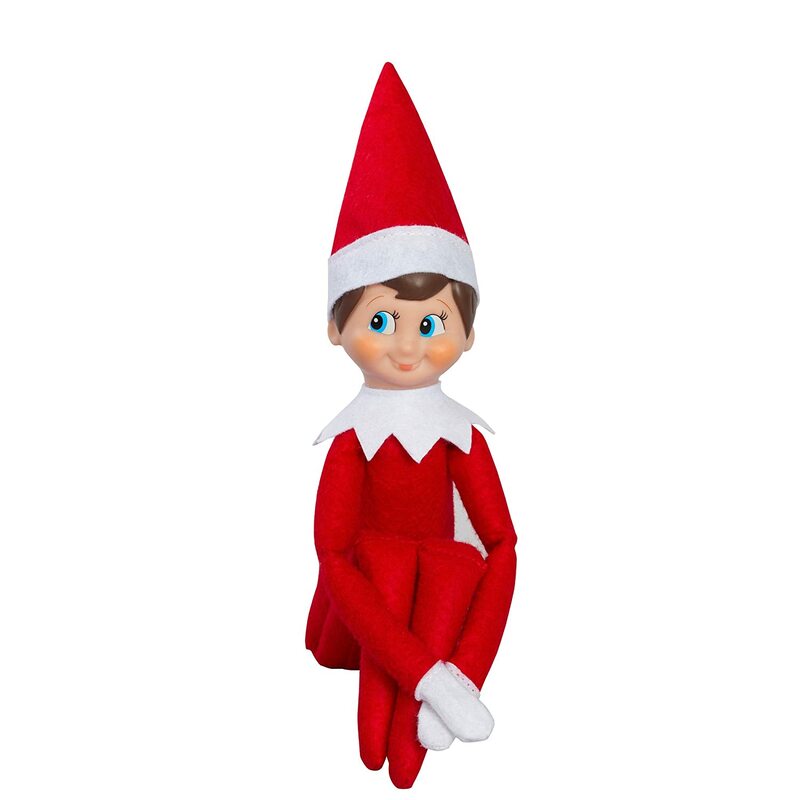 Again, Elf on the Shelf is just a fun, simple tradition that only happens one month of the year in our home. 4. New Jammies: Every year between Christmas and Thanksgiving, I give both of my kids a cute new set of pajamas. They look forward to them, and I love picking them out. My daughter's set this year is in cozy turquoise flannel with pictures of hot cocoa and cookies on them, and my son's set features Snoopy and Woodstock. Cuteness! 5. Cliche Holiday Movies: Yikes! Embarrassing, right?! Oh well, I cannot deny it: my husband and I cannot resist a good old fashioned Hallmark Christmas movie, often featuring members of the Full House cast or other C list stars you kinda sorta remember from your youth. Who doesn't want to unwind at the end of the day with a carefree, simple little heartwarmer? 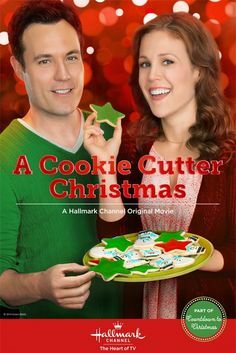 All I can do is...SMILE at this cheesy classic Hallmark promo! And you guessed it-- I'll probably tune in. Like most people, I will probably always feel some anxiety during the holidays, but I am also determined to help make the holidays FUN for our family. I want to create happy memories for my children, and for my husband and me. Even the simplest traditions take work, but I think it's worth it. How about you? How do you celebrate the holidays in your home? What are your favorite new or old traditions? P.S. If you also happen to love horses like I do, I have another article up on HorseChannel.com. You can find it here! Precious!! Goodness!the jammies sound delicious!And cookies Julia, I need a box too ha ha!!! So wonderfully done!!! Oops my exclamations are going out of control! My kids love Christmas too. I always longed to celebrate Christmas as a child so I make sure my boys do. My eight year old is reading ' A Christmas carol ' this year. And I am sad that he no longer wants to wear cute pajamas. Only everything Batman is allowed. The little one wants his to be exactly alike. So, I am surviving batmen without going batty, keeping calm and baking. Love to you and yours!!!!! Haha, yes! The jammies ARE delicious! I want to eat my children up at night when they wear them :). I would love to give you a box of cookies if I could (though I'm sure you are a much better cook than I am). Our cookies aren't fancy or anything-- the goal is to make them edible :). Hilarious about the Batman stuff-- my kids haven't quite gotten into superheroes yet, but I'm sure they will soon! 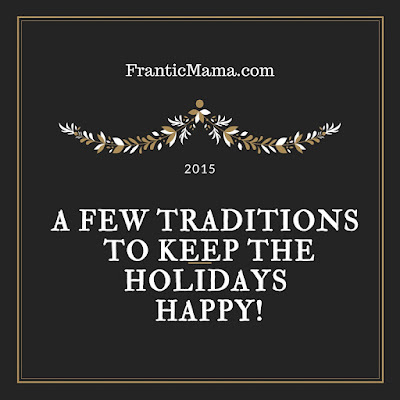 Aw, great traditions! (Although you know my feelings about the Elf. ;) ) I'm searching to find this balance too... my husband and I are redefining some things about our holiday season this year (like where and when and how much extended-family time gets) and so far it's feeling much more relaxed and I LIKE that! Good for you for discussing boundaries and plans ahead of time. I think that is so helpful, yet so easy to sweep under the rug until the last minute, when everyone is taxed and tired. I forget your feelings about the elf! I'll have to go through the archives :).